Witnessing Kayla (a lovable Elsie Fisher), the 14-year-old girl, fail in her numerous attempts to gather multiple likes and views for her self-help YouTube videos we sense the emptiness she feels on a daily basis. It’s easier to understand then how she can feel not good enough, defeated, and emotionally devastated when high school awaits her only in a few months. Eighth Grade charts the final week of her middle-school career, and what a grueling journey it has been. She’s recently been voted by her peers as being the “most quiet” in her class. Like anyone truly notices. Everyone has their eyes glued to their cell phones throughout the day. They are all nocturnal beasts as well, scrolling maddeningly and habitually through Instagram and Facebook feeds (is Facebook still a thing?, one teenage girl asks), either looking for hope, love, or the next topic of discussion. Burnham’s direction, with its pulsating soundtracking and at times dizzying direction of particular events, allows Eighth Grade to slowly emerge and reveal itself to be a horror film that focuses on the emotionally crippling travails of a young girl searching for confidence and acceptance through social media. In what should be a delightful event, a pool party quickly inherits terrifying qualities. The music over the scene becomes almost deafening, the camera roams its locale in a frenzy manner, and what we see are young teenage children screaming and contorting their bodies like pretzels. They could either be infected with a plague or a spirit. At least this is what it feels like to be inside the head of Kayla, who was invited to a pool party by one of the cool girl’s (Catherine Oliviere) mother (Missy Yager). Kayla is petrified to emerge from the restroom where she is getting dressed. She’s wearing a bright green one-piece and ready to be seen by all. To her, the scene is sinister when she’s making her way into the pool. We are in her head and feel the fear, too. Mr. Burnham realizes other fears throughout his superb film and he creates them, each consisting of incomparable awkwardness that’s difficult to watch. Kayla was urged to go to the party by her father (Josh Hamilton). He is Kayla’s only parent. We learn later on in the film that her mother left when Kayla was just a newborn (the film doesn’t make it clear if she died or not). The two tend to have an understanding relationship. In one scene at their dinner table Kayla is totally consumed with her phone. Her earphones are in and the brightness of the screen dominates her face. Her father tries having a conversation with her. It’s painfully awkward watching it as Kayla continuously takes out her earphones, obviously frustrated with her dad, to answer his questions about her day with just one word. He is unfazed by this as we sit and watch how awkward it is. It probably happened multiple times to him and he’s just lucky and happy to receive some acknowledgment from her. But what 14-year-old girl wants compliments from their father? They’re hungry for “cooler” adulation. As the school year winds down, some of the eighth graders are paired with high-school buddies for one day. It’s a chance for the younger middle-schoolers to get exposed to the rhythms of high-school life. Kayla is paired up with Olivia (Emily Robinson), a senior who seems to have the right look, clothes, and confidence. She is down to earth and approachable. Something Kayla’s stuck-up classmates aren’t. She accepts Kayla for who she is. Burnham, who also wrote the script, gives this part of the film a fresh face. The film could’ve put Kayla through a rigorous gauntlet of verbal abuse and incessant neglect from high-schoolers, giving her more reason to panic. By allowing Olivia to be on the same wavelength as Kayla (the two form a genuine friendship), the film offers some form of hope for her: what lies ahead isn’t always going to be the same, as long as you’re making strides to change your situation. Kayla does. Rarely does the film find her stagnant. She’s always making the effort to win the approval and attention of her peers with her videos, her “things-to-do-better lists” she makes in her binder, and mustering up every bit of courage she has just to talk to a fellow classmate. Bo Burnham, who is 27-years old, understands the opportunities and pitfalls that come along with social media. Starting out as a YouTuber himself in 2006, he knows how social media platforms can propel a career forward and earn one unlimited praise. We expect him to hit every mark with his narrative when tackling social media topics, but what surprises is how purely he regards emotional resonance between two individuals. 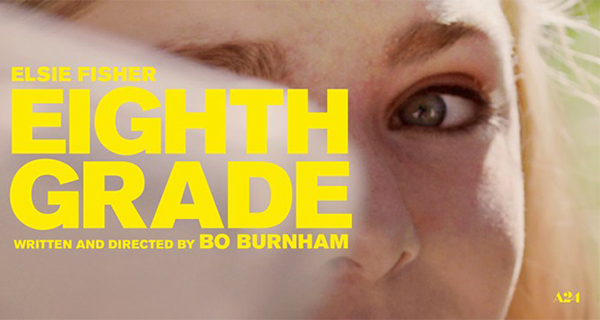 Eighth Grade captivates most when the richness, ugliness, and complexities of human interaction are exposed. Kayla needs only to remove her earphones and unplug for a few minutes and open up. By regarding these intimate moments away from our small screens, Burnham captures the essence of human connection. NOTE – FREE screenings will be held in theaters every U.S. state this Wednesday night, August 8th, with NO ratings enforced. Visit the official site for a list of participating theaters.